There's been some drama our way thanks to these fantastic tulips. A few years back I stood back from the garden, squinted, and all I could see was a big green blur. There was no variation. And in that moment I realized I needed to plant more drama, and that can come through foliage or flower. I thought I'd share a little of our goth success. You know, all those kids in black, black eyeliner, lined up behind the gym smoking cigarettes. Those are my tulips. More later this week with all of the black foliage in the garden: I started a list and the list just kept going and going and going. I'm loving this impact and drama in the garden, but I'd love to hear from you. 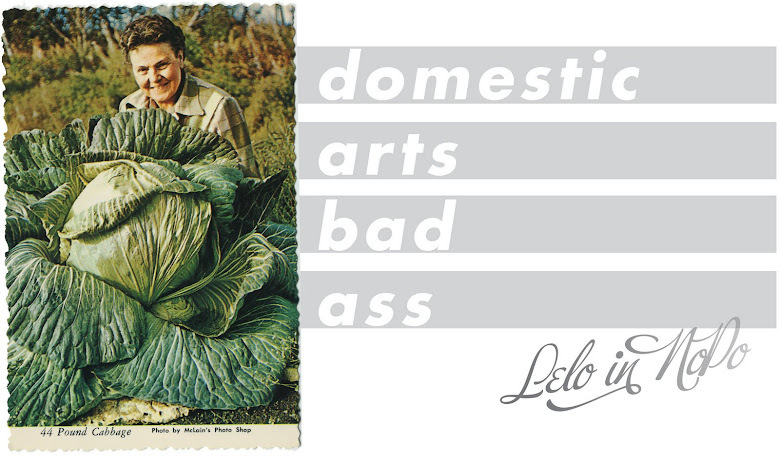 What do you plant for drama in your garden? I am not so much into cohesive color patterns in my gardens - but I do love color & do my best to have a wide variety of color. sunflowers !! orig they were planted in a bed. the plan was that there would be one full row of them all along the fence. (the birds had a different idea.) now there is not one sunflower in the bed boarder. the patio/ table are hidden in a forest of sunflowers by july. they grow where they want. all over. and the next year they volunteer, wherever they want, by the trash cans, etc..... because the seeds are fresh every year, they grow tall. every once in a while we get a mutant that grows 9 feet tall. these are not the variety with the single mammoth big flower. stalks with several shoot offs. main stalks are about 2.5" in diameter. i used to try and control things, now i embrace and cultivate the things that thrive naturally. and i credit for being some wonder grower. i will make a note to post pics in july !!! Hi Amy! 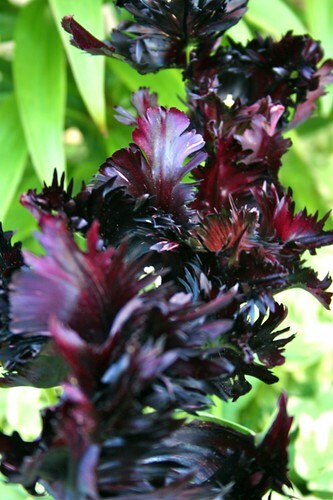 Alas, I do not have goth tulip cutters but aren't they the craziest things those feather/parrot tulips? When I see them every year I can't stop singing Freak show on the dance floor. I love them. She's super frakin' out. Marie, what a great reminder about sunflowers and the great drama they bring. And how much do I love that you use the word mutant? here is a little something embedded in jayne's world that wink might enjoy. i am hoping for mutants this year. there have been several that neighbors still speak of. legends of years gone by. love you !! Cat - Here's a preview of one: Sambucus nigra, though I don't know how it will handle your Texan heat. Love those tulips! I planted a bunch next to the stairs of an apartment I lived in years ago and I recently got to see them still blooming, love it. My drama currently has to be the agaves. Nothing says drama quite like a plant that can send you to the hospital. Right? I planted 2000 bulbs last fall and enjoyed a carpet of crocus this spring and so many tulips and daffodils that people stopped and took pictures. Worth every penny and all the planting blisters for such joy! Goregous! Do you by any chance remember the name of these beauties? I planted some fuki (aka petasites japonica) a few years ago because I liked the big leaves. It's done so well that it's beyond dramatic and now appears ready to eat my house. Definite drama; love the ruffled tulips. I love Darmera peltata for the bold leaves and interesting Spring flowers. These are definitely dramatic and successful. A+ for your never-failing visual sense. 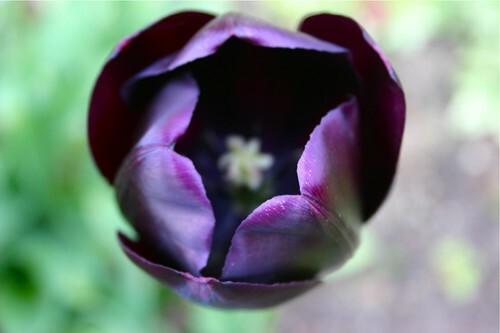 I've tried planing black tulips (Queen of the Night), but they bloomed magenta. Weird. 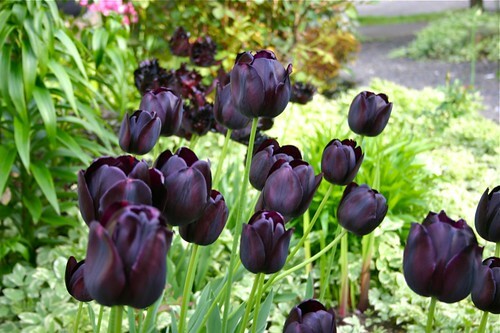 I've noticed other black tulips in NE that were the correct goth color the first year were planted but bloomed magenta in following years. Something in the soil here? Or one of those tulip viruses? I've got 4 Queen of Night that came up out of the dozen I planted. Guess I'll have to wait for the real drama next year. Still, they a stunning counterpoint to the Pink Diamond and 'Salome' daffys. Not to mention the lovely white irises that I tried to smother with newspaper (stop laughing! I didn't know!) last fall. My gf suggested I put in parrot tulips, but I wasn't so sure I wanted to go there. Seeing yours, now I'm really tempted. I apparently also cultivate drama in my garden by growing a similar (maybe exactly the same) variety of tulips, but not the same kind of drama. About two weeks ago, I was ready to pick all of them for one dark, goth arrangement. They were in one of the beds on the border of our yard. I came home Thursday night, and someone had stolen ALL of them. A couple dozen beautiful, dark tulips, gone. Saturday morning, I was still enraged when I was getting a pedicure at The Body Bistro. Side note: while that place may be inauspiciously close to the Wishing Well, I have never had a better pedicure. And for $17! While regaling Ree, the owner, with my tale of woe, I mentioned my urge to punch whoever stole the flowers in the face, and she gently reminded me that gardening should be peaceful and relaxing, and that I might need to take a step back and relax. True words. I am glad you got photos of yours. I'll try again next year! Drama? Stopped the pesticide hell that the former owners wreaked havoc with all over the new yard. Took bags of the crap OUT of the shed and over to hazmat people. the frogs, snakes and birds are already happier. Lelo, i need you for a consult!!! We will pay, just come by, please. Love the black, it's the new lavender. hahaha. 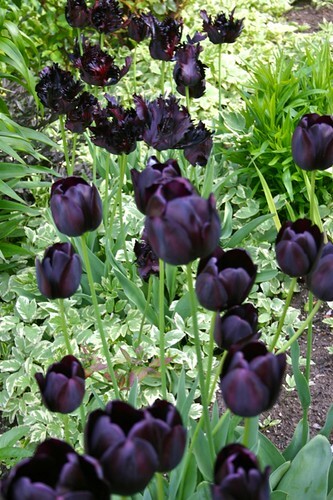 I found this cool post about dark tulips I thought I'd share.